I'll say it again. Ways of the Force, please! Resolution of the Force ?? The movie may also end with a scroll to signify The End/Happily Ever After, which is different sort of concept for the others. The first thing that popped in my mind when I read about TrIXie being potentially the new working name of IX - sorry for all the Beatrice and Trixie out there - was this scene from Lucifer. Not very romantic, I know. I will miss Tom Ellis/Lucifer Morningstar *sigh*. They could annoyingly make it about the resistance, like Rise of the Resistance/Rebellion (was a track from TLJ). It could also be something super random like they did with Phantom Menace and Attack of the Clones. Who would have of that of those lol? If they want something force related, they already used the word force and jedi, can't think of another word that can give that message. Maybe something about khyber crystals? 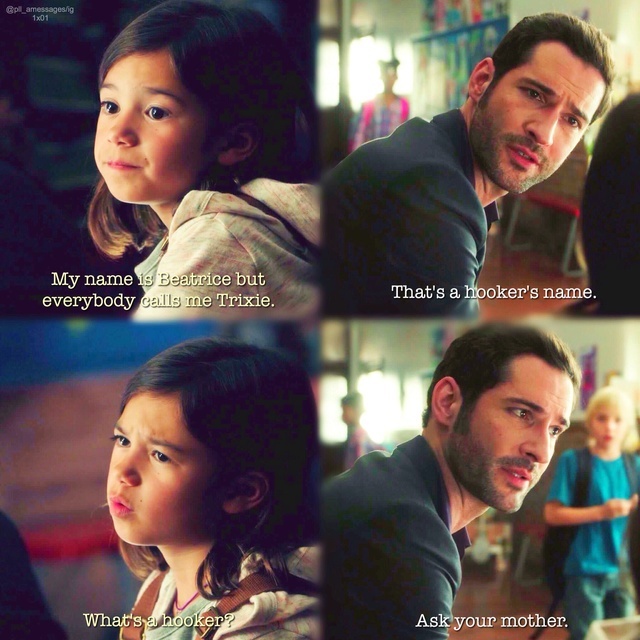 @SanghaRen wrote: The first thing that popped in my mind when I read about TrIXie being potentially the new working name of IX - sorry for all the Beatrice and Trixie out there - was this scene from Lucifer. Not very romantic, I know. Should we change the name of this thread, since it isn't Black Diamond anymore? Just hit me now. The TrIXie thread! I saw this on I think was the Mirror and decided to screenshot it as I found it to be quite an interesting coincidence. Victoria Mahoney (IX's 2nd unit director) tweeted an item yesterday, which is interesting. Perhaps unrelated to IX, or maybe she is hinting, due to the hashtag and the . . ., that Dawn is in the title ?? (If related to IX, yet not the title, probably a hint of "Hope is like the sun, if you only believe in it when you can see it, you’ll never make it through the night." We all know sun...son. With the mention of Dawn, perhaps a hint that IX begins with Ben in redemption - it is not 2nd or 3rd act....it will be seen in the 1st. @SW_Heroine_Journey wrote: Victoria Mahoney (IX's 2nd unit director) tweeted an item yesterday, which is interesting. Perhaps unrelated to IX, or maybe she is hinting, due to the hashtag and the . . ., that Dawn is in the title ?? (If related to IX, yet not the title, probably a hint of "Hope is like the sun, if you only believe in it when you can see it, you’ll never make it through the night." We all know sun...son. With the mention of Dawn, perhaps a hint that IX begins with Ben in redemption - it is not 2nd or 3rd act....it will be seen in the 1st. As long as it's not "Breaking Dawn"! We already get accused of Twilight-izing Star Wars enough as is. 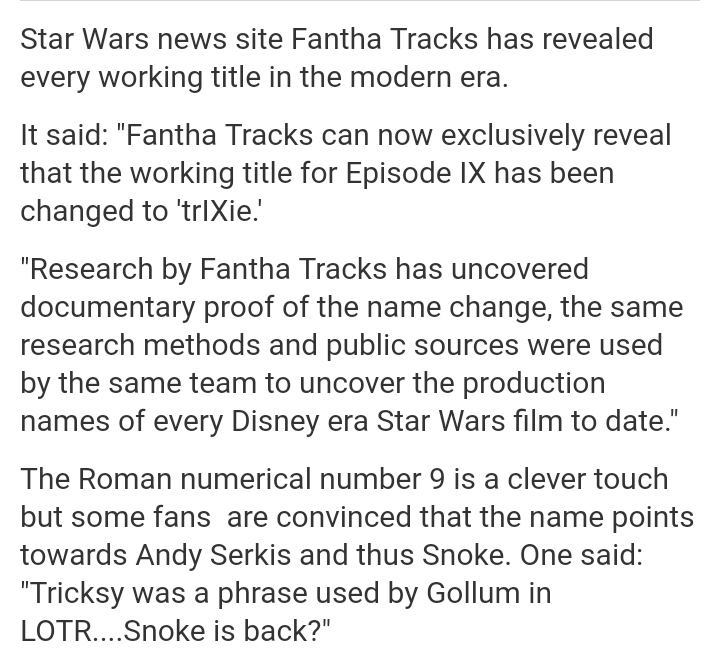 They can also stick to the tradition of including "Jedi" or "Sith" in the title of the final episode in the trilogy and make it something like "Dawn of the Jedi" idk. As for Trixie as the working title, do you guys think it's a My Little Pony main antagonist getting redeemed reference or a Dante trekking through hell to save his beloved and redeem himself reference? Either way it's a win-win? Or could it have something to do with a return to Jakku? I like to think it is a reference to both the Trixie in My Little Pony and Beatrice/Dante. Ultimately, both point towards redemption! It seems as though they are going to be very obvious about the redemption. The wink wink mystery for the audience/most will be Reylo (and perhaps other surprises). Oooh...perhaps!? That IX begins on Jakku? I do wonder if the King Abdullah Petroleum Studies and Research Centre will be used in filming for IX (her tweet is connected to a video about it - architectural wise). Maybe Ben's palace? Some interesting location? Although it is in Saudi Arabia, the visual effects department can easily change the background, so it could be a spaceship, or on Naboo, etc. It's a very visually interesting location. @SW_Heroine_Journey If they're going to be obvious about redemption, they'll be very mysterious about Kylo's survival as well as Reylo. I could also see some other twist regarding the jedi academy, like what happened to Luke's students, or maybe something Ben/Leia related. What a cool looking location! Could the dawn hashtag be referring to the start of the filming maybe? It could be a palace.. could also be maybe a FO facility or even an old empire facility - If I had my wish.. it would be the location where Snoke stashed away all the force relics he collected and inherited off the empire. Holocrons... light sabers.. It could be like Dryden Vos' room on steroids - just think of all the mummified hands and treasures we could have fun exploring haaaa.. and whooooo maybe the Kazerath Device is stored at this location too. oh I know.. maybe the lost arc of the covenant too.. Okay. I need to get a grip haaaaa..
Maybe Dawn is the name of the Reylo baby, and the title for IX will obviously be "Revenge of the Reylos"
On a more serious note, if the title uses the same "R... of the [group]" pattern as III and VI, it could be "Reign of the First Order", which is also an indirect quote from the TLJ opening crawl (similar to TLJ being mentioned in the crawl of TFA). Though it sounds more like a title for the middle chapter like "The Empire Strikes Back", TLJ did end with only a small part of the Resistance/Rebellion left, which means the First Order might now be at the peak of its reign, so it would be fitting. This title also wouldn't give away Ben's redemption. The title could also be something about restoring hope, which was also mentioned in the TLJ crawl, and which I would prefer over the cheesy "spark" quote. I like the suggestion "Redemption of the Son," but that would be too much of a spoiler. Oooh I like Dawn as name if reylo baby ( girl ). That’s nice . Was thinking ( sorry if someone has this already ) but what about “ a new dawn “ - I know this would tie in with the Star Wars book of that name ( so did last Jedi though )but the book is about the first Jedi ( legends now I know ). . Also part of me thinks this sequel trilogy might spell out one title ie The force awakens the last Jedi .... but then you’d have to have To or from etc at beginning of the title . Wonder if Victoria's tweet is more of a hint about Bendemption. I still have this feeling the marketing will be more obvious about the redemption, yet the big reveal in the movie is Reylo and if Ben lives or dies (I do agree with others who mentioned that). With the force theme playing during the hand touching scene, and this is about balance...the title might reflect that. @AhsokaTano wrote: Oooh I like Dawn as name if reylo baby ( girl ). That’s nice . Was thinking ( sorry if someone has this already ) but what about “ a new dawn “ - I know this would tie in with the Star Wars book of that name ( so did last Jedi though )but the book is about the first Jedi ( legends now I know ). . Also part of me thinks this sequel trilogy might spell out one title ie The force awakens the last Jedi .... but then you’d have to have To or from etc at beginning of the title . With the Last Jedi, it took its title from a Legends book, but here I don't think they will use the title of a Canon book released four years ago. To me, Dawn sounds strange for name, but in the Star Wars universe there were stranger name, so why not.